Why Does the Dental Assistant Take an X-Ray? Dental x-rays: it’s a routine you’re probably quite familiar with. You show up for your appointment. After a brief time in the waiting room you are called back to a room. The dental assistant will then come and take your x-rays. Depending on the office you might do them in that same room or you may go to a separate x-ray room. Either way, you will put on a lead bib to protect yourself from any radiation. Depending on the type of x-ray you may also bite down on what looks like a piece of paper or plastic. Now hold still…and that’s it! So why do we take x-rays? Dental x-rays are a great way for a dentist to get a good idea of your overall oral health. Dentists use x-rays as a tool to look at parts of the mouth they cannot see with their eyes alone. An x-ray can give them a lot of important information. They are a helpful for finding things like cavities, tooth decay, and checking the health of gums and roots. They are also useful in finding problems with the mouth, jaw, or other dental devices. There are several different types of x-rays that can be taken. Each looks at the mouth in a different way. Having multiple views can be a great tool for a dentist as it helps give a comprehensive view of the mouth. 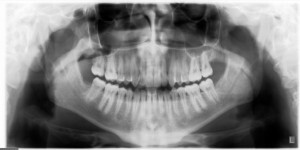 X-rays can vary from looking at the entire jaw line or a detailed look at a single tooth. Your dentist will pick the x-rays that he thinks are best for you. Can a Dental Assistant Take X-Rays? Absolutely! In fact, most dentists like to hire a dental assistant that is x-ray certified. As an x-ray certified dental assistant they are able to take on more responsibilities in the office. In Arizona, a person must be x-ray certified in order to take an x-ray. The American Institute of Dental Assisting is proud to offer the training that students need in order to pass the x-ray test. We know that becoming x-ray certified will make dental assistants a valuable asset to their employer. Are you interested in becoming a dental assistant? Contact us today to find out how you can receive the best dental assistant training in Arizona.